by Rocky Smiley (At-Large Representative, SER MWGL Chapter), Joe DiMisa (Secretary and Membership Chairperson, SER MWGL Chapter), Michael Enright (Ohio Representative, SER MWGL Chapter), and Mary Klunk (Five Rivers MetroParks). 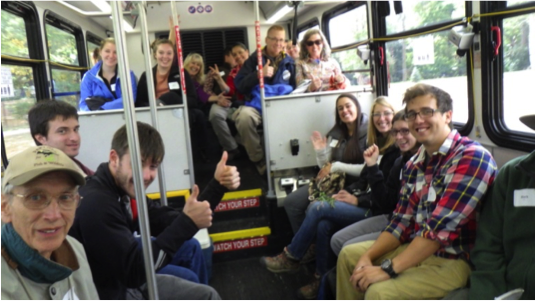 Twenty-two individuals from Ohio attended the Dayton Restoration Field Trip and Social on Thursday October 1, 2015 in Dayton, Ohio. This one day event was organized by the SER MWGL Chapter and Five Rivers MetroParks as part of the Chapter’s Annual State Membership Event. The day began with coffee and donuts at the Possum Creek MetroPark Education Center. 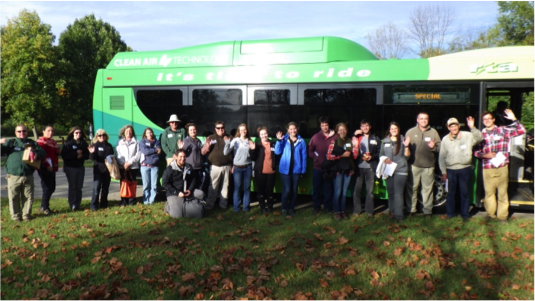 We then traveled together via bus (donated by the Greater Dayton Regional Transit Authority) to the first site at Carriage Hill MetroPark, which is a forest restoration site. This site was originally an agricultural field dominated by invasive plant species. The restoration practices used included large scale plantings of native trees with volunteers, mowing and herbicide application, use of plant barriers to protect newly planted trees from deer browsing and rubbing, and mycorrizal injections. What made this site unique was the intensive effort made by Five Rivers MetroParks in both the implementation of the restoration project and the follow up evaluations of the plantings. 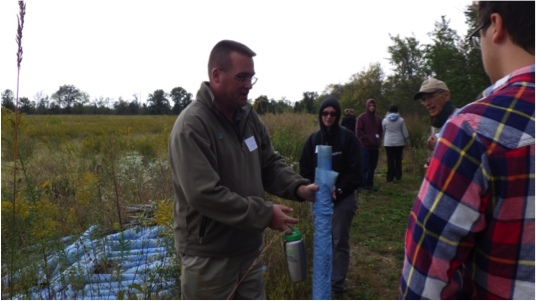 Michael Enright discusses lessons learned from use of different types of plant barriers. We then traveled to Englewood MetroPark and learned about the low head dam removal project undertaken on the Stillwater River located within the site. This project was initiated as a result of the water quality problems associated with nutrients and dissolved oxygen resulting from the low head dam. The project involved removal of the low head dam and using pieces of the dam as part of the streambank stabilization practices immediately below the dam and in the construction of the v structures installed upstream to promote development of riffle pool sequences. Following the visit to the low head dam site we enjoyed a nice lunch and the beautiful fall day at Englewood MetroPark. Our third stop in the afternoon was at the Great Miami Wetland Mitigation Bank. This wetland mitigation site is unique in that it involves wetland, riparian, and headwater stream restoration for mitigation credits. We learned about the implemented practices used to restore a large forested wetland and the headwater stream onsite as well as the evaluations being conducted to document the impacts of the restoration efforts. Hiking the perimeter also conveyed the sheer scale of this restoration effort and how it would increase in size in the future with the incorporation of the former golf course and agricultural field adjacent to it. Our final stop of the tour was back at Possum Creek MetroPark where we got to see some of the oldest and most diverse restored prairies within Five Rivers MetroParks property. Restoration and management of this site involves use of prescribed burns, addition of topsoil, control of invasive plant species, and planting of native plant species. 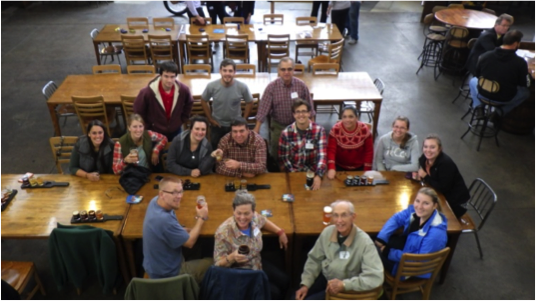 We concluded the day at Warped Wing Brewery with pizza, drinks, fellowship, and a discussion of a wide range of ecological restoration topics and enjoyable tangents. Additionally, if you are in the Dayton area we encourage you to visit one of the many Five Rivers MetroParks properties not only for the opportunity to view some interesting restoration projects, but to experience some beautiful natural areas within a large metropolitan area in the Midwest.